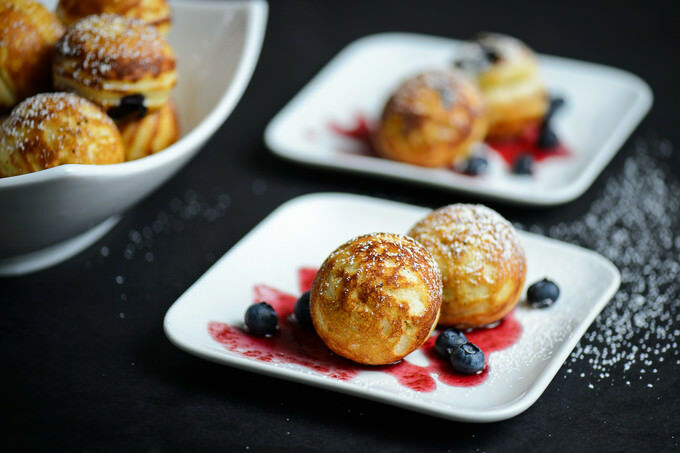 These Pancake Puffs called Aebleskiver (meaning: apple slices in Danish) taste divine. If your family loves pancakes, this will be a huge hit in your circle. The only extra thing you will need to obtain for it is the aebleskiver pan, which you can get from amazon or stores like Bed Bath and Beyond. You only buy it once, but it serves you forever. I’ve had my cast iron one for good eight years now. You can also purchase a teflon one, if it is easier that way. While taking care of cast iron might be slightly harder, I like how it makes perfect pancakes with a harder shell outside and uniform and fluffy on the inside.